Prof Rob van Barneveld, always thinking laterally. WHEN I announced a world-first initiative by Autism CRC and SunPork Farms to employ autistic adults in animal care positions in Australia’s pork industry in 2016, it felt good. My client Pork CRC, along with the South Australian government, contributed $150,000 for what was then a pilot project in SA and Queensland to employ a minimum of four autistic adults in animal care positions within SunPork Farms operations in each state. Collectively, development and assessment of the program represented a financial commitment by SunPork Farms, Autism CRC and Specialisterne exceeding $800,000. Building capacity within the agricultural sector to employ autistic adults. The project offered life-changing opportunities for people on the spectrum and further improvement in the welfare of livestock. Then Pork CRC CEO Roger Campbell said the CRC for High Integrity Australian Pork was proud to be involved with such a game-changing project, which he branded the most exciting he’d been involved with. “This initiative will open up a whole new world to autistic people and those on the autism spectrum and with Australia’s pork industry needing to boost its pool of dedicated animal carers to maintain and improve our existing high welfare standards, this is a win-win for all parties,” Dr Campbell said. 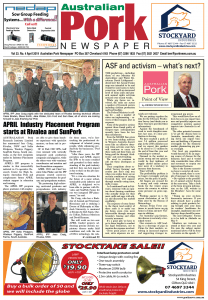 Well, I am now thrilled that two and a half years down the track, SunPork Farms reportedly employs more than a dozen individuals on the spectrum, making up about 3 percent of the workforce based in Queensland and SA. 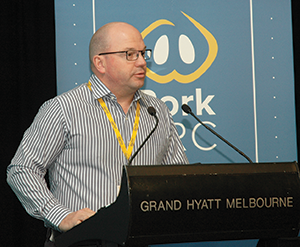 In a recent report in Victoria’s The Weekly Times, SunPork managing director Rob van Barneveld, the driver behind the initiative, was quoted as saying SunPork had found the perfect match by employing autistic people. A high attention to detail and a close affinity with animals were, apparently, the sometimes hard-to-find traits SunPork Farms needed specifically from their staff in animal care roles. A past president of Autism Queensland and current chair of Autism CRC, Rob has a daughter who was initially diagnosed with autism but later re-diagnosed with Rett syndrome. Rob explained to The Weekly Times that SunPork looked at how they could have a workplace environment that allowed them to employ the people they needed in the roles they needed. He acknowledged that integrating the new employees was as much of an educational process with the existing workforce as it was with the people being employed. SunPork therefore now promotes an inclusive culture, where it doesn’t just have autistic people working with autistic people, but farm workplaces that are fully inclusive. The program has enjoyed a very high retention rate, something I understand Rob is very proud of. Some candidates SunPork employed had never had a job or worked away from home, despite being qualified for the job. His humble and inclusive reply: “Thanks Brendon. We are very proud of it. Regards Rob.” And so he and SunPork deservedly should be, as should Australia’s pork community, which now, more than ever before, needs good news stories that demonstrate inclusiveness and prioritising of human and animal welfare. The two, after all, go hand-in-hand.